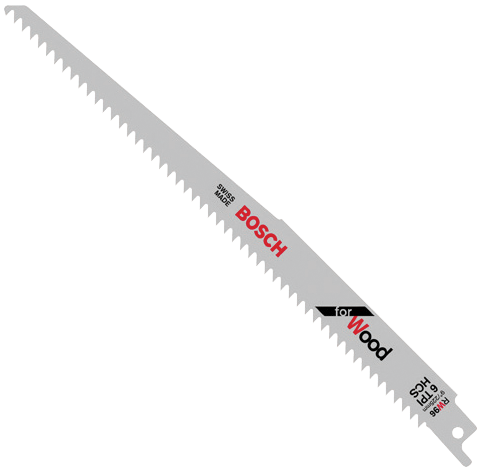 Bosch Wood Reciprocating Saw Blades feature bi-metal construction, delivering maximum life and durability in heavy use. These blades are optimized for cutting efficiency. The pro-grade recip blades have super sharp flex-shaft-ground teeth and 6 TPI, designed for fast cutting. They are made with taper back and plunge tips for easier starts. They have precision-ground teeth and sturdy .05 In. thick blades for high performance. By incorporating high-quality materials, best manufacturing processes and proven tooth-design features, Bosch provides professional reciprocating saw blades that cut faster and last longer.